Stay dry, sleep well, and camp happy in a Columbia Cougar Flats Tent. Learn why families love 2 room, Columbia Cougar Flats ii cabin tents with user reviews. It's rare at Camping Tent Reviews to review a luxurious family shelter that's both affordable and receives dozens of 5 star ratings by consumers. When we do, we make sure to give the tent it's proper due--the Columbia Cougar Flats Cabin Tent is one of those shelters. With 2 rooms, huge square footage, and excellent ventilation, the foundation is set for this to be a great family camping tent. Add in all the extra amenities designed to make your trip more enjoyable and you have one of the best family cabin tents ever made. The thing to remember is this: Columbia Cougar Flats Tents provide everything you need in a tent for family camping, while being lighter on the wallet than competing brands, such as Eureka tents. Pack Size: 22.55" by 7"
The specifications of the Columbia Cougar Flats ii Cabin Tent are the same as the original Columbia Cougar Flats Tent. It is just the newer model. 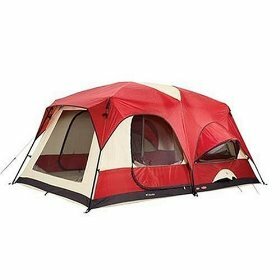 Families in need of a dome style cabin tent for camping cannot go wrong the Cougar Flats by Columbia. Need a quick reason why: no other tent has as many positive reviews by consumers. Here are specific advantages: First off, the Cougar Flats cabin tent is huge. 150 square feet and two rooms ensures every family member will get their much needed privacy while camping. 8 people in one tent can get stuffy without proper ventilation. But with the Cougar Flats ii by Columbia, you will never breathe stale air thanks to two large bay windows and doors. Organization is essential when camping in an 8 person tent. Columbia recognizes this and makes organizing easy with internal pockets, a gear loft, and cup-holders for beverages (although many consumer reviews claim the shelves are gimmicky and useless, the gear loft is quite valuable). Ventilation during storms can get tricky--you want airflow in and out of the tent, but don't want your equipment getting wet. 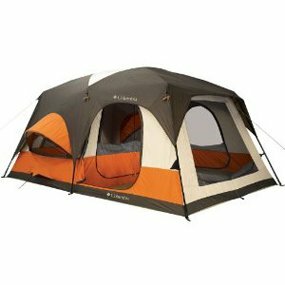 The Columbia Cougar Flats tent uses a bay window design, allowing your windows to be wide open during the worst storms. Finally, with a max height of over 7 feet, only Yao Ming would have to duck when roaming through the tent. By only glancing at reviews, you'd think that Columbia Cougar Flats ii cabin tents have nothing wrong with them; however, there are a handful of disadvantages consumers must be aware of. First is the tent pole material, which is steel and fiberglass. Aluminum tent poles are more reliable and withstand inclement weather better. One reviewer even claimed that their tent pole broke after a single camping trip with the Cougar Flats ii tent. Next is weight. At 54 pounds, the Cougar Flats cabin tent might weigh more than your kid. Columbia reduces the impact of a heavy tent by providing a wheeled carrying bag. However, you still need to lug this shelter out of your car and at 54 pounds you risk throwing your back out--not the best way to start a camping trip. Finally, there is no outdoor porch area. Other large, family tents for camping provide an awning area for lounging during inclement weather or for protection from the sun. Unfortunately, the Columbia Cougar Flats tent lacks this useful feature. An additional use of the awning area is for removing and storing wet/muddy gear before entering the tent. Without one, kids will inevitably track in dirt, debris, and mud. The Columbia Cougar Flats Cabin Tent is one of the best family camping tents. 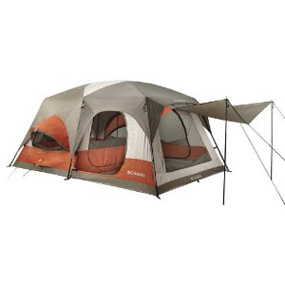 Even consumers that give 3 star reviews to this tent still love it--they only wish a few things were better designed. The bottom line is this: Budget minded consumers in need of a family dome tent can't go wrong with the Columbia Cougar Flats. Have you been using Columbia tents? Share your Columbia tent reviews and let us know how it worked for you!